A family trip to Alaska, a lot of time in a van and unexpected lessons on deer antler aka Lu Rong. On a family trip to Alaska, we quickly learned Alaska is too big for road trips. However, we did see the most incredible scenery and enjoyed some off the beaten path family activities. An ingrained family tradition. 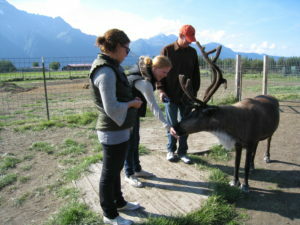 As the planner of the trip, I decide the family must pay a visit to a reindeer farm just north of Anchorage. Our teens had their i-pods and they are accustom to my crazy ideas of fun, so off we went on the 5 hour round trip drive. Admittedly, I had an ulterior motive, I wanted to learn about Lu Rong, deer antlers, from a true source, and this was a golden opportunity I couldn’t miss. In Chinese Medicine, the deer antler also known as Lu Rong is a prized and highly sought after commodity. Deer antler has been used for hundreds of years for health and longevity and is considered a yang tonic in Chinese Herbal Medicine. Reindeer antlers our one source of antlers however much more commonly used is the smaller breed of Red Deer. Today the most expensive deer antler is harvested in New Zealand but Alaska is also a source and prices range anywhere from $100.00 for a 100 gram bottle of granules to $500.00, quality can vary widely. I admit, a small ulterior motive, I was investigating whether importing deer antler might become part of my herb business. Wow, I had no idea the antlers were so sensitive. In fact, males who commonly fight each other will not touch one another while their antlers are in velvet, a growth stage named for the velvet like fur on the antlers. There is a tremendous amount of blood flow to the antlers which supports this growth and there is a correlation between the head being the most Yang part of the body, the antlers growing from the top of the head and deer antlers categorized as a yang tonic. Eskimos have used deer antler soup for it’s internal warming (yang) properties for as long as anyone can document. 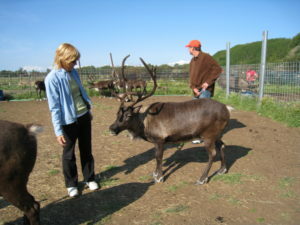 We arrived at the reindeer farm which was operated by a family (and some hired help), mainly for the purposes of selling reindeer meat. The tourist business is a summer sideline. 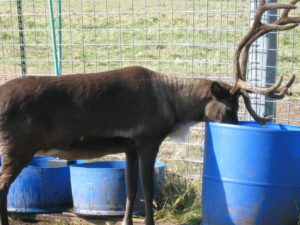 We paid a small entrance fee and along with two other families with young children were given instructions before we were allowed to enter the main pen and hand feed the reindeer some supplied food. I knew that deer are very skittish, nervous animals by nature and easily startled, but what else I learned was surprising. The number one rule was no touching the antlers of any animal that is “in velvet”. The reason was simple. The antlers are extremely sensitive when they are growing and just touching the velvety soft exterior, especially at the tips, could freak out the animal and be dangerous for us. We could pet the deer anywhere else exception being, the antlers. 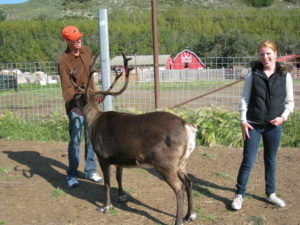 What else I learned; deer antlers, whether reindeer or red deer are not so easy to harvest. It would seem harmless to saw them off once they are essentially dead and have no more blood flow. The antlers die naturally every year and either fall off or are broken when the deer fight. But, deer antlers are harvested when there is still blood flow to them, best when the tips are still rounded which means they are still growing. Our guides explained they would never harvest antlers while in velvet because it would be like cutting off one of your fingers. The antler is truly an limb extension of the animal. If just touching an antler can make the deer skittish what do you thinking cutting off an antler would do to the deer? Extremely painful to say the least. This was the moment I decided no matter how much can be earned from deer antlers I could never be part of that industry. If the antlers were used once they are naturally shed by the animals, that would be different. But by the time the antlers are naturally falling off they are dead, no blood flow no nerve endings. No medicinal value. To be fair, I am told that many people who raise deer exclusively for their antlers as a Chinese medicinal, use a veterinarian to perform the sawing off operation. Some say they tranquilize the animals and/or provide Novocain. Once the antlers are cut the deer’s head is wrapped in bandages and something is given to reduce the bleeding at the site. Antlers are always harvested when they are at the height of the growth stage. If you have ever seen slices of deer antler the highest grade are red in the middle, from the blood flow. Regardless, once I spent just a few minutes with these beautiful docile creatures, I knew I didn’t want any part of an industry initiating animal cruelty. Yang tonics are great strong medicine. Chinese Herbal Medicine has plenty of plant based yang tonics, no animal products would ever be part of Pacific Herbs. 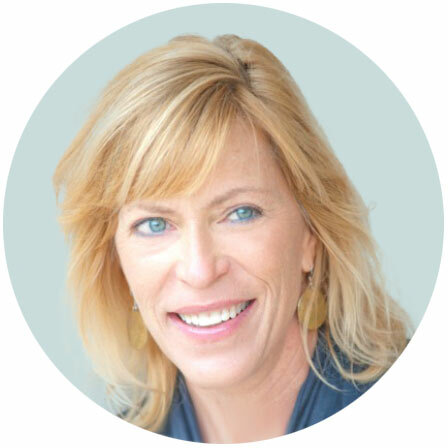 I have been using Velvet Antler for two years now and I must say it is great!